The SC240 Compact Clamp Meter with Temperature packs a big punch in a compact meter. With features that rival many full-sized clamp meters, this auto ranging digital multimeter packs a ton of functions into a compact, easy to handle shape. 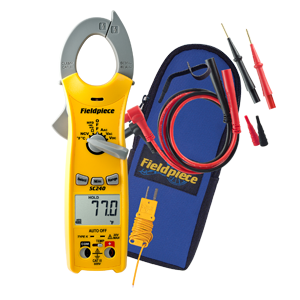 It includes temperature in both Fahrenheit and Celsius, capacitance as well as non-contact voltage indicators. It also packs in most of the other HVACR ranges you use everyday. Some technicians use the SC240 as their everyday DMM, others as a back-up or second meter to get more testing done in less time. 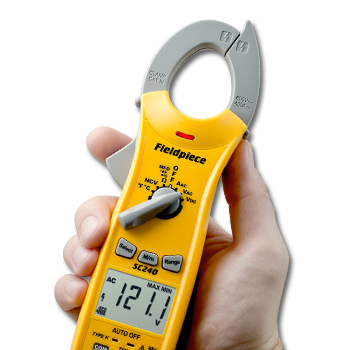 This compact HVACR clamp meter was deigned to make your job easier, safer, and faster no matter where you choose to rank it in your bag. Test leads: Use UL listed test leads that comply to UL61010-031 rated CATIII 600V or above. Included test leads are gold-plated and have removeable safety caps. 95 TruReward$ points will be placed in your account when you buy this item.